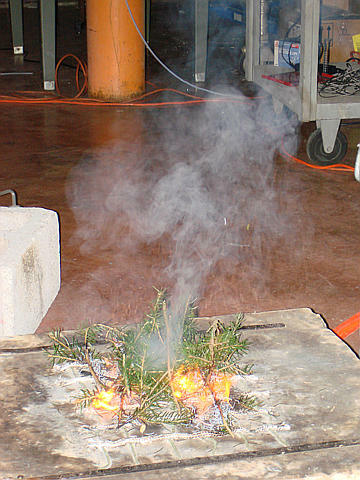 Smoldering ponderosa pine fires contain alkaloids. RICHLAND, Wash. — Researchers have detected common plant toxins that affect human health and ecosystems in smoke from forest fires. The results from the new study also suggest that smoldering fires may produce more toxins than wildfires — a reason to keep human exposures to a minimum during controlled burns. Finding these toxins — known as alkaloids — helps researchers understand how they cycle through earth and air. Smoke-related alkaloids in the environment can change aquatic and terrestrial ecosystems, as well as where and when clouds form. The study, which was of Ponderosa pines, by scientists at the Department of Energy’s Pacific Northwest National Laboratory will appear June 1 in Environmental Science and Technology. "Ponderosa pines are widespread in areas that are prone to forest fires," said PNNL physical chemist Julia Laskin, one of the coauthors. "This study shows us which molecules are in smoke so we can better understand smoke's environmental impact." As trees and underbrush burn, billowing smoke made up of tiny particles drifts away. The tiny particles contain a variety of natural compounds released from the plant matter. Researchers have long suspected the presence of alkaloids in smoke or detected them in air during fire season, but no one had directly measured them coming off a fire. The PNNL researchers had recently developed the technology to pick out alkaloids from the background of similar molecules. To investigate chemicals given off by fires, the team captured some smoke from test fires organized by Colorado State University researchers. These researchers were doing controlled burns of ponderosa pines, underbrush and other fuels at the Forest Service Fire Science Laboratory in Missoula, Mont. The scientists collected smoke samples in a device that corrals small particles. Using high-resolution spectrometry instruments in EMSL, DOE's Environmental Molecular Sciences Laboratory on the PNNL campus, they then determined which molecules the smoke contained. At EMSL, the researchers used the new methods to glean highly detailed information about the smoke’s composition. The team found a wide variety of molecules. When they compared their results to other studies, they found that 70 percent of these molecules had not been previously reported in smoke. “The research significantly expanded the previous observations,” said aerosol chemist and coauthor Alexander Laskin. In addition, 10 to 30 percent of these were alkaloids, common plant molecules that proved to be quite resistant to the high temperatures of fire. Plants often use alkaloids for protection, because they can poison other plants and animals, including humans. Alkaloids also have medicinal value (caffeine and nicotine, for example, are well-known alkaloids that aren't found in pine trees). A large percentage of the alkaloids were those that carry biologically useful nitrogen through atmospheric, terrestrial and aquatic environments. Because of this, the results suggest smoke might be an important step in this transport. Also, the nitrogen-containing alkaloids have a basic pH, which can make cloud-forming particles less acidic, and in turn impact cloud formation that is critical to global agriculture and water supplies. The researchers also found that the abundance of alkaloids depends on how vigorously the fire burns. Smoldering fires such as those in controlled burns produce more of the compounds than blazing fires such as those fanned by high winds. Because some plant alkaloids might be harmful, the result could affect planned fires upwind of human populations. For future studies, the researchers are developing a method to quantify the alkaloids and related compounds in smoke to better understand their chemical composition and prevalence. A Laskin, J Smith, and J Laskin. 2009. “Molecular Characterization of Nitrogen Containing Organic Compounds in Biomass Burning Aerosols Using High Resolution Mass Spectrometry.” Environmental Science and Technology. DOI: 10.1021/es803456n. This work was funded by the DOE Office of Science through the Office of Basic Energy Sciences, the Office of Biological and Environmental Research, and the Science Undergraduate Laboratory Internship program.